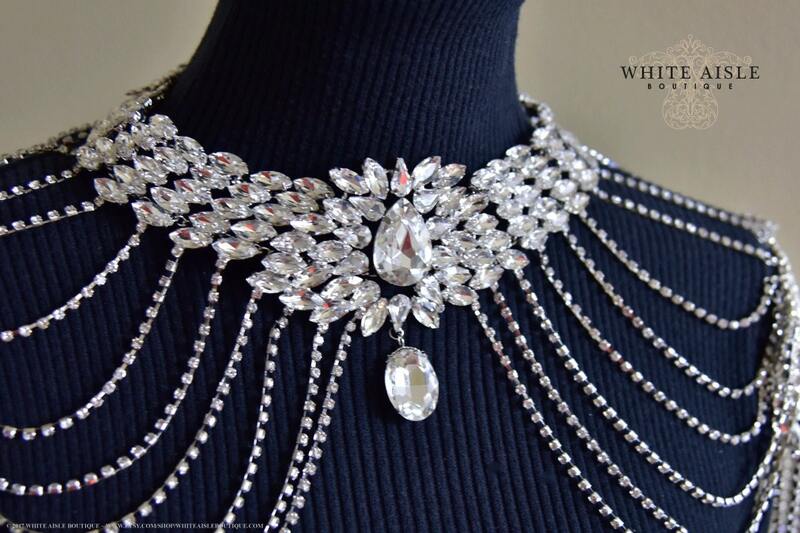 This gorgeous vintage inspired crystal bridal shoulder necklace is the perfect finishing touch for the bride wanting to add red carpet glamour to her wedding day, or for any special occasion. 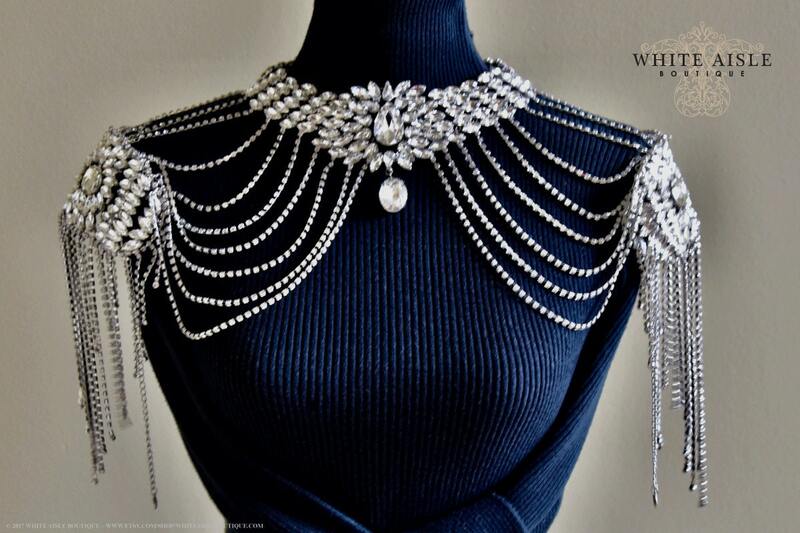 The beautiful statement necklace features all clear rhinestones and crystals, and the swags on the shoulders are rhinestone studded. 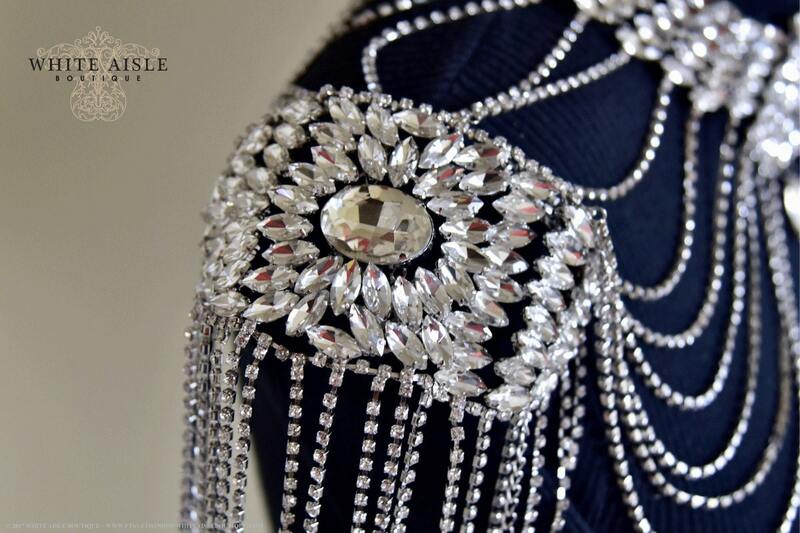 On the back, a large crystal drop adds extra sparkle. All are set in silver metal. STUNNING!! 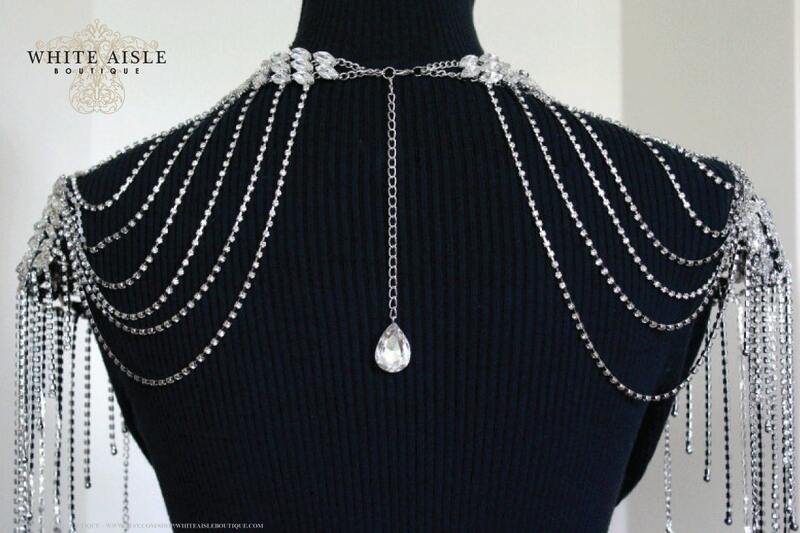 Necklace measure about 15" long + crystal back drop extension. Front drop is about 3 1/2". Back drop is about 6 1/2". Swags on shoulder drops is about 10". Earrings and headpiece not included. Please contact me for additional quantities. Payment is through Credit Card or PayPal. All orders must be paid in full at the time order is placed. All custom orders must be paid in full at the time order is placed. No work or time spent on design process will begin until payment is received in full. Virginia residents will automatically be charged sales tax. If you would like to cancel your order, please let me know with 12 hours of placing your order. If the item is "IN STOCK" it will be shipped out within 1-3 business days from the date the order is placed and payment is received. The standard shipping method included with the listings is USPS First Class Mail and takes 2-5 business days. This includes delivery confirmation. USPS Priority Mail (takes 1-3 business days, includes tracking, delivery confirmation, and $100 insurance). USPS Priority Mail Express (takes 1-2 business days, includes tracking, delivery confirmation, and $100 insurance). Pricing depends on the item and can be found during checkout. As a courtesy to my customers, I make sure that you are sent an email via Etsy once your order has been shipped. Please note that you are responsible for tracking the progress of your shipment. Once a package has left my possession and is in transit, I am not responsible for delivery delays that may occur due to inclement weather, acts of nature, loss, stolen or damage, or any other circumstance beyond my control. No refund will be given for shipping charges for delayed, lost, or stolen shipments. The standard international shipping method is USPS First Class International Mail. Although this is the most affordable shipping method for International orders, this method does NOT include tracking once outside the US, and can take weeks to arrive. I STRONGLY recommend contacting me PRIOR to making your purchase to include tracking and insurance. I will be more than happy to provide a quote for you. I can not guarantee any shipping times to countries outside the U.S. Once it's been shipped it is best to take the tracking number to your local post office to find out the current location of the shipment and delivery information. Please note that once a package has left my possession and is in transit, I am not responsible for delivery delays that may occur due to inclement weather, acts of nature, loss, stolen or damage, or any other circumstance beyond my control. No refund will be given for shipping charges for delayed, lost, or stolen shipments. For all International orders: Please note that you will be responsible for any and all customs import duties/taxes incurred. It is not included in my pricing or shipping fees. If you need rush shipping for any reason, please contact me prior to making your purchase. I will provide a quote for you depending on how quickly you need it to arrive. Please note that once a package has left my possession and is in transit, I am not responsible for delivery delays that may occur due to inclement weather, acts of nature, loss or damage, or any other circumstance beyond my control. No refund will be given for shipping charges on delayed, lost or stolen shipments. Due to the fact that it is an inconvenience for most of my customers, and that they are not at home during the day to sign for packages, I do NOT ask for signature upon delivery. If you would like your order to include signature delivery, please contact me prior to making your purchase. Please note that adding signature delivery will add to the cost of my current shipping costs. All items are packaged very carefully, and are shipped in strong boxes. I do not use padded envelopes, as these will not protect items well enough. Please contact me within 3 days of receiving your order. Please ship it back to me within 7 days of delivery. Due to the fact that each custom order is special ordered and is customized for the individual, all custom orders may not be returned or exchanged. I do a very thorough quality control inspection and package each piece very carefully prior to shipping. If damage occurs during shipping, please let me know within 24 hours of receiving it and I will address the issue immediately. Due to the fact that people can perceive colors differently, and that colors and shades of colors, can vary so much - especially whites, ivories, champagnes, etc., I do not guarantee color of items. In addition, computer screens, iPads, smartphones, and all other devices with screens, can vary due to personal settings, and thus alter the true color of items. Although I do my very best to use images that most accurately represent the true color of items, due to the nature of photography, there are times where this is difficult and I make no guarantee of color. It is my intention to take photos that best represent the true color of the items. Many of my designs are recreations of an original design that has sold previously. I will attempt to the best of my ability to recreate the pictured product, however, due to the fact that these are crafted by hand, slight variations may occur. 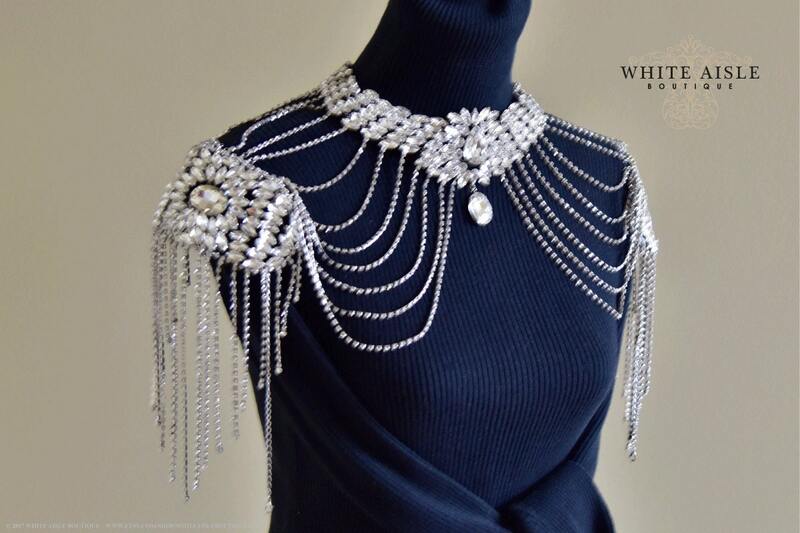 Beautiful, as described & very well made.. Can't wait to wear it on my wedding day, will post a pic for sure!!! © 2019 White Aisle Boutique.